When I think of my wife, I always think of the back of her head. I picture cracking her lovely skull, unspooling her brain, trying to get answers. The primal questions of a marriage: What are you thinking? How are you feeling? What have we done to each other? What will we do? “What have we done to each other? What will we do?” The movie starts with these questions. In the midst of clearing work and preparing for new year, I sneaked a moment for Gone Girl. I had to, because everyone told me it’s worth it. I haven’t read the book. I’m sorry. But for once, an adapted screenplay movie has aroused me so much that I walked straight into the bookstore for it right after the show. Now all I’m waiting is the right moment (aka midnight) to turn the pages. The truth is, adapted screenplay (movie) usually lacks conviction due to the short build-up time for characters. 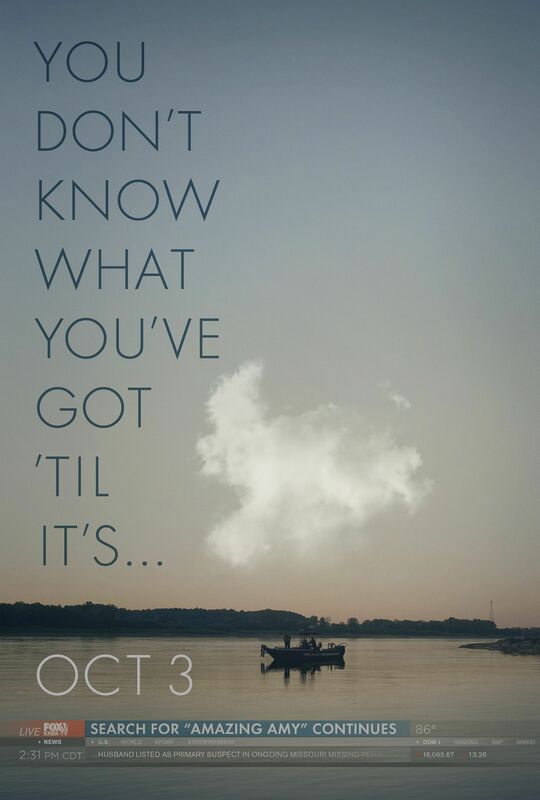 On the other hand, a book has plenty of time and pages to help you to understand the characters and flow, in this instant Nick Dunne and Amy Elliot Dunne, why is she the twisted person she is and what exactly happened.But Gone Girl the movie got the right tempo and set-up to lure you further into the dark side. I can’t help but think it is because the adapted screenplay is written by the original creator, Ms. Gillian Flynn. She clearly made wise choices in choosing the right scenes and dialogues for the movie. Nick Dunne: You’re delusional. I mean, you’re insane, why would you even want this? Yes, I loved you and then all we did was resent each other, try to control each other. We caused each other pain. A wife framed her husband for murdering her but in the twist of fate and with a minor accident, she has to change her plan and ultimately return to her husband. Deep inside, her husband knows what she has done. That hatred towards a failed marriage and betrayal leads her into darkness, but I think it is her imagination and delusion that caused it. Amy said: “I forged the man of my dreams.” Sometimes the differences in a man before and after being married is entirely an uneven play in a woman’s head. Didn’t you worship the man (blindly) before the wedding and only to loathe at him after? Rosemund Pike was exceptional in the movie, dotting every line clearly with her heart and soul. She is Amy Dunne. Calm and cool, she cleverly dropping hint along the way with the best acting. Though with the same amount of time on-screen, Ben Affleck quietly supported Rosemund Pike but never overpower her, pushing the story further and created the perfect Yin and Yang match. Everyone focuses on how crazy a woman can get when she is angry, yet I think the basis is that we all have something we love so dearly that it turns into hatred all together. Evidently, an unhappy childhood and a failed marriage turns one into a delusional psychopath. The movie is packed with so many interesting details and I’m sure it can only be better in the book. I’ll definitely watch it again soon. 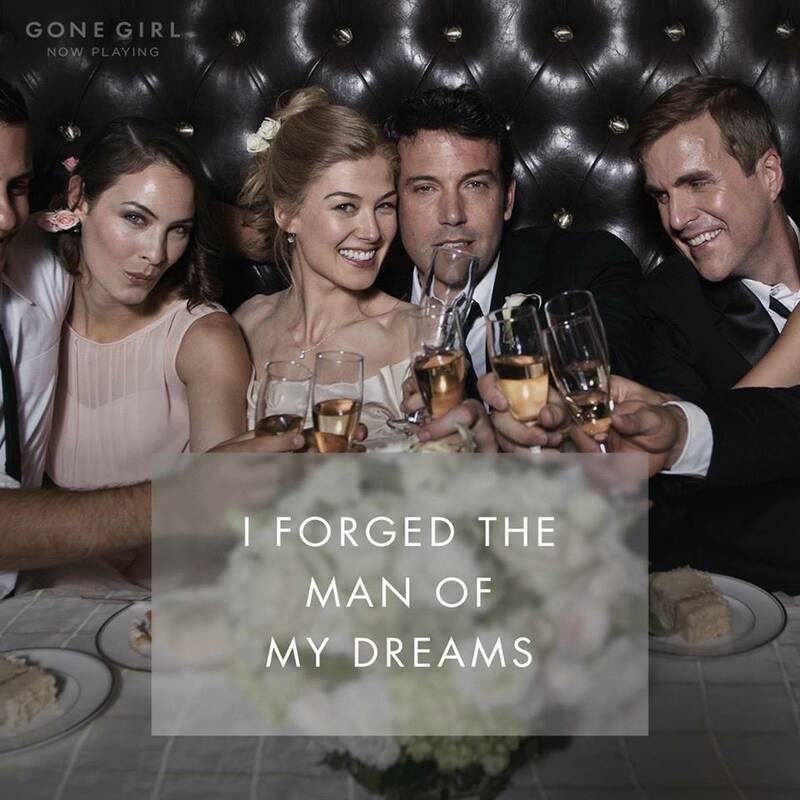 If you have nothing much for the New Year, go catch Gone Girl. It’s worth it.